Allows you to inspect the health of any cow in just seconds! Advanced, electronic technology detects invisible, subclinical mastitis. Shows readings of all 4 quarters at once to compare them easily. Sensors find and analyze minute changes occurring in the electrical resistance of the cow’s milk. Just fill the measurement cup with a few squirts of milk from the cow to be inspected. Then, simply press the switch and take the reading displayed. This early detection enables early treatment, preventing the risk of permanent damage to the udder. It also helps improve returns by unmasking mastitis in its earliest, invisible stage. 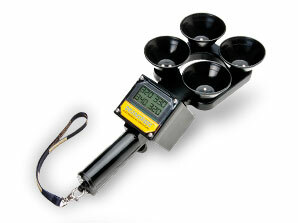 Allows you to conduct quick, concise checks of your herd to ensure higher-quality milk production. Features large LCD display for easy-to-see readings with low-battery indicator. Waterproof, shockproof polypropylene construction. Requires one “9V” battery (not included).